1. I’m grateful for an order of 95 bars of soap for a bridal shower. 2. I’m grateful for crossing the last item off my summer bucket list. Jumping on my neighbors trampoline. 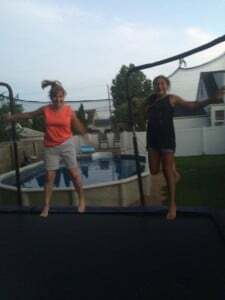 Giana and her friend were jumping and when I asked if I could join in, they graciously said yes. I’m sure these two 13 year old girls really didn’t want to spend time jumping with me but they did. Let me tell you, it is Hard work! 3. I’m grateful for a relaxed week at work, I was able to get in later than usual and sleep in a little. 4. I’m grateful for Sunday night’s dinner at Anthony’s with my parents. Pizza and chicken wings, it doesn’t get better than that. 5. I am grateful for a break in the hot, humid weather. My next door neighbor has a trampoline in their backyard. I’ve been eyeing that all summer. Gianna lives next door to me Donna. I’ve been watching her and her friends jumping on the trampoline all summer long too. Once I finally got on it, I couldn’t believe how exhausting it was. Those girls are in great shape! Nice list, thank you for sharing. I am grateful for being able to collaborate with some amazing business owners are who are so willing to share their expertise and wisdom with others. So true Diana. I’m also grateful I’ve gotten out of my way and allowed myself to ask for help when I need it. I’ve let go of that fear of looking stupid and found so many helpful business owners who are willing to share.